1 Pour the couscous into a large bowl, and add just enough boiling water to cover the couscous. Then cover with cling film and set aside for 15 minutes, so that the couscous can soften and absorb the water. 2 For a light and delicious dressing, mix together the Hellmann’s Real Mayonnaise, yoghurt, a tablespoon of lemon juice, lemon zest, cumin and paprika in a small bowl and set aside. 3 Using a table fork, stir up the couscous so that it takes on a fluffy consistency. Then mix with the olive oil, the remaining two tablespoons of lemon juice. 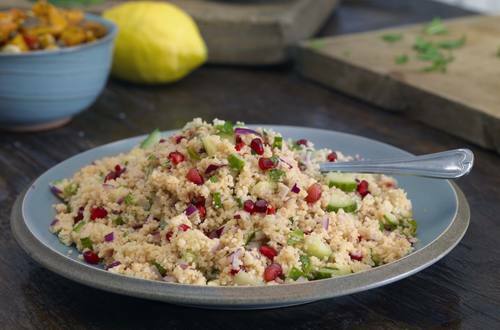 4 Finally, add the red onion, cucumber, pomegranate seeds and mint, drizzle the couscous with the salad dressing, and serve.